Labor Day weekend is always a popular time for Georgia weddings. What better location for a late summer wedding than the North Georgia Mountains? The Chimneys at Big Canoe has a rich history with its foundation in the Tate family who opened a marble quarry in the area in 1850. With a boom in the marble industry in the early 1900’s there was a need for improvements and more schools. The wedding ceremony site is next to the two remaining chimneys that were part of the house built for the community’s schoolteachers and principle. As a former Chimney’s bride myself, I was more than pleased to help Nikki when she contacted Décor to Adore at Peggy Echols urging. Nikki was interested in using texture in her linens, bringing in shades of gold and deep purple, for an elegant reception. We decided to use a champagne pinched taffeta and accent her chiavari chairs with plum satin sashes. 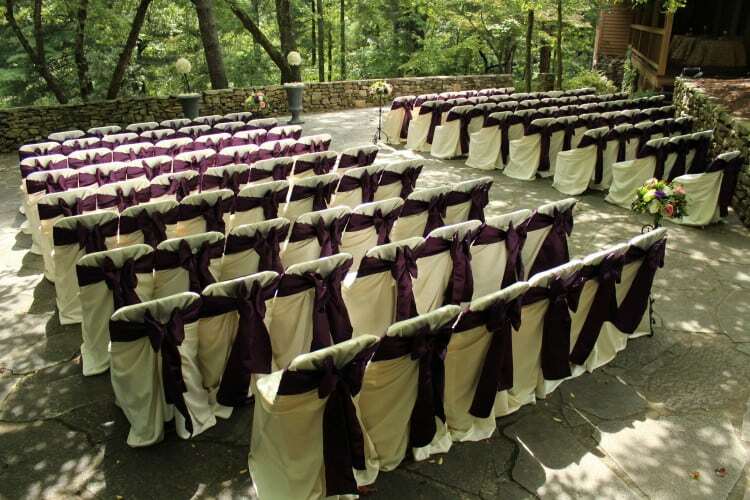 We carried the beautiful plum satin outside for her ceremony chairs along with ivory chair covers.